NASCAR’s CEO and Chairman, Brian France, was arrested in New York on Sunday night for driving under the influence of alcohol and for drug possession of a controlled substance known as oxycodone. France, a member of the famous France family for their involvement in the world of motorsports, took a leave of absence from NASCAR. He will be replaced in his role on an interim basis by Vice Chairman and Executive Vice President Jim France, Brian’s uncle. The 56-year-old was arrested on Sunday night and released on Monday morning after an arraignment. According to a police statement by the Sag Harbor Village on New York’s Long Island, France “was operating a 2017 Lexus northbound on Main Street failing to stop at a duly posted stop sign.” After he was pulled over by the police, they found that France was intoxicated and he was arrested. “Upon search of his person, due to a lawful arrest, France was in possession of oxycodone pills.” The report said that France’s alcohol blood levels were more than twice the legal limit of 0.08. He also struggled to keep his balance during the sobriety test. This was not the first time that France had a run-in with law enforcement due to his intoxication. In 2006, it was reported that France hit a car and a tree in a Daytona Beach parking lot. He was reckless and he struggled to get out of the car, witnesses back then said. However, he wasn’t given a DUI because officers were not able to confront France until he had returned to his house and was no longer driving. 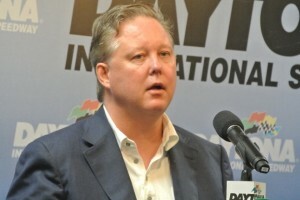 France became CEO of NASCAR in 2003. His grandfather, William HG France founded the organization in 1948 while his father, Bill Jr., served as CEO until he stepped down in 2000.